Garrett Brown, 21, hugs his mother, Traci, June 30, 2015. Garrett was among the 272 people who died in Maine in 2015 as the result of overdosing — a 31 percent jump over 2014, which saw a record 208 overdose deaths. 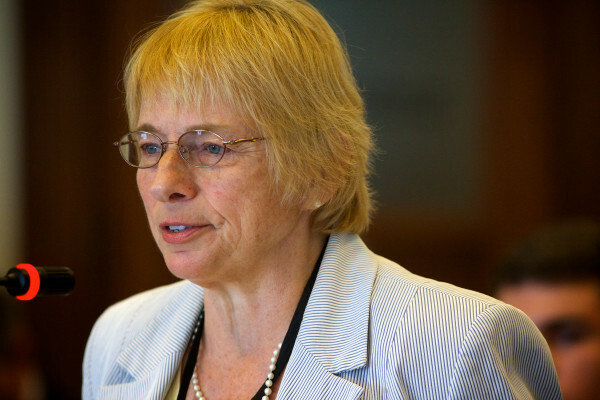 AUGUSTA, Maine — Maine has set another grim record for drug overdose deaths, Attorney General Janet Mills said Monday in a news release. In 2015, 272 people died in Maine as the result of overdosing — a 31 percent jump over 2014, which saw a record 208 overdose deaths, Mills said. The total number of overdose deaths last year exceeded initial estimates largely due to an increase in deaths caused by heroin, fentanyl or a combination of the two drugs in the second half of the year. In 2015, 157 deaths were caused by heroin and/or nonpharmaceutical fentanyl and 111 were caused by pharmaceutical opioids, Mills said. Last year’s overdose deaths caused by illegal drugs exceeded overdose deaths caused by pharmaceutical opioids for the first time, even though the number of deaths caused by pharmaceutical opioids increased slightly as well. Nearly all deaths were in combination with other intoxicants. “These figures are shocking,” Mills said. “Maine averaged more than five drug deaths per week. That is five families every week losing a loved one to drugs. These are sons and daughters, mothers and fathers, our neighbors, our friends. “I applaud the families who have come forward to share their stories about the struggles they have endured in watching a loved one succumb to addiction and the pain it has caused,” she said. Men accounted for two-thirds of last year’s overdose deaths, Mills said. The ages of those who died ranged from 18 to 89, though most deaths were of those under the age of 60, state statistics indicted. The average age of those who overdosed was 42, or one year younger that the average age of a Maine resident. While all counties recorded at least one overdose death, about 78 percent of them occurred in Maine’s five most populous counties, which account for 65 percent of the state’s population. Cumberland County had 86 overdose deaths, or 32 percent of the statewide total. The city of Portland recorded 46 deaths, followed by Lewiston with 15 deaths and Bangor with 13 deaths. Comparing the 2014 and 2015 death rate per 100,000 of population for the five largest counties, Cumberland County’s rate increased from 15.3 to 30.5 — an increase of 100 percent. Meanwhile, Kennebec County increased by 65 percent, Penobscot County was up 30 percent, Androscoggin County increased 4 percent and York County increased 3 percent. Heroin was a factor in 107 of last year’s overdose deaths and 94 of those deaths included at least one other drug or alcohol noted on the death certificate. Of the 87 deaths attributed to fentanyl or acetyl fentanyl, 68 included at least one other drug or alcohol noted on the death certificate. Of last year’s overdose deaths, 89 percent were certified as unintentional. Another 10 percent were deemed intentional and 1 percent were undetermined. The drug overdose death analysis for 2015 was conducted for the state medical examiner’s office by Marcella Sorg of the Margaret Chase Smith Policy Center at the University of Maine.